Nhu Nguyen (Xerantheum@Flickr) of Berkeley, California submitted this photo of Oxalis palmifrons, taken in his garden, via the Botany Photo of the Day Flickr Pool. Much appreciated Nhu! Oxalidaceae is the wood sorrel family, containing mostly annual and perennial herbaceous plants (some shrubs, too). Oxalis has the highest species diversity within the family, with over 90% of the members of this family ascribed to that genus. Of the roughly 700 species in Oxalis, most are distributed in the tropics and subtropics, though some can be found in more temperate regions. Oxalis palmifrons is a native of the arid Karoo region in the Western Cape of South Africa. Oxalis contains species of ornamental and food value, but the genus also has its “villains”, with some species being pesky weeds. Reproduction in Oxalis can vary from bulbils to runners to seeds. Many species have evolved heterostyly, where male and female parts are spaced apart on the flower (height or location) to ensure they are not self-fertilized. The delicate pink flowers of Oxalis palmifrons are shown on the Pacific Bulb Society wiki: Oxalis palmifrons. Flowers, though, are not what Oxalis palmifrons is known for — it’s the foliage that is of most horticultural interest. The plants tend to form a dense, low cover over the soil during the winter. Their leaves are quite tiny (1cm on average), but can contain up to 20 “fronds” on each leaf, and will fold at night and reopen during the day. 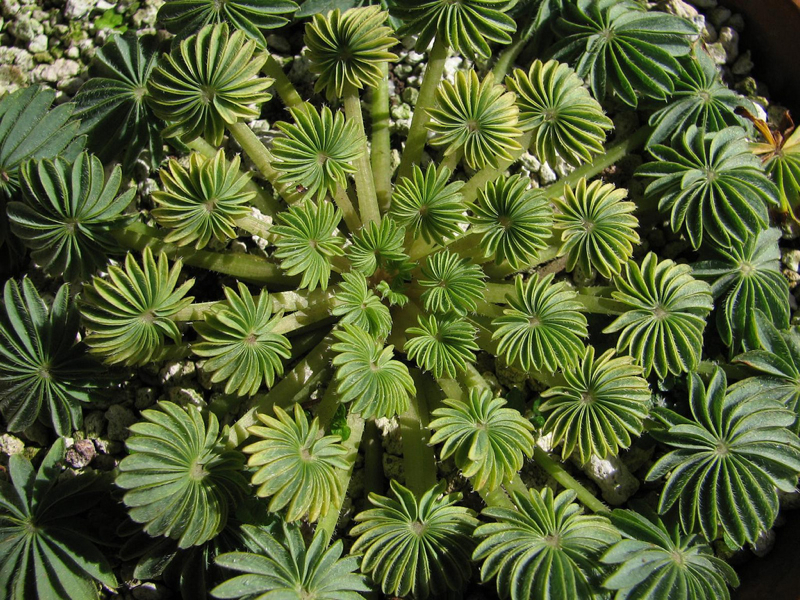 Leaves of Oxalis palmifrons are also covered in hairs, which can help reflect the high-intensity sunlight plants experience in the arid Karoo. When I first looked at this, I thought it was a large aeonium. It’s difficult to tell the scale in this photo. Approximately how large are the leaves? Oxalis, no kidding? Great foliage. Thanks for showing the link to the flower. I would never have guessed the scale of the leaves to flowers from photo. I very much enjoy seeing all the wonderful postings. The oxalis pic is great and a breath of fresh air here in Z4a at 5800 feet with still-snow-covered lawn. Wow! An amazing photo of a plant new to me. Thanks! This is beautiful! I would certainly welcome this charming “weed” into my garden any day. Very cool looking plant, with almost alarmingly large flowers relative to overall plant size. I’ve often wondered how Oxalis pes-caprae – a nearly ubiquitous weed (although a rather attractive – and tasty – one) here in SoCal – colonizes new areas when it doesn’t produce seeds, only reproducing through bulbs. I know that the bulbs are eaten by something – probably rats – and maybe they collect them and drop or bury some, or maybe the bulbs, which are usually just below the surface, get stuck in shoe treads… I just don’t know. Any ideas/knowledge? Neat! we have native Oxalis species here in the Rockies with “shamrock”-like leaves — also palmately compound — but still it’s hard to imagine them being in the same genus.